-- Select a Size/Color -- Size 8 Size 10 Size 12 Size 14 - Out of Stock! Size 16 Size 18 Size 20 - Out of Stock! Size 22 Size 24 - Out of Stock! Dog's will be fashion FABulous in the Colorblock Puffer Dog Coat by fabdog® in Red, Tan and Navy. 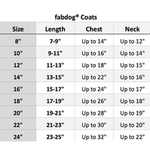 Help keep your dog warm this cold weather season with this Colorblock Dog Coat by fabdog®. 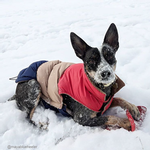 This water resistant coat has a 100% nylon exterior and polyfilled to keep your pup toasty and warm this winter. Reflective piping for added safety at night. Drawstring cinch ups at base of coat for a great fit. Touch fastener closure on band along belly. It is machine washable and has a harness leash hole on the back for convenience. Size 8: Chest up to 14" Neck up to 12" Length 7-9"
Size 10: Chest up to 16" Neck up to 14" Length 9-11"
Size 12: Chest up to 18" Neck up to 15" Length 11-13"
Size 14: Chest up to 22" Neck up to 16" Length 13-15"
Size 16: Chest up to 24" Neck up to 17" Length 15-17"
Size 18: Chest up to 26" Neck up to 18" Length 17-19"
Size 22: Chest up to 30" Neck up to 20" Length 21-23"
Size 24: Chest up to 32" Neck up to 22" Length 23-25"
Posted On 12/24/16 by Hailey H from , Yes, Hailey H recommends this product! 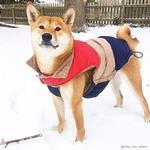 This vest isn't what I expected, and am so happy about it. I really just got it because I thought it looked cute, but it's actually very well made! It has a lot of fluff in it so it's well insulated and is well made where it velcros under the chest almost like you fasten a diaper on a baby. It's super easy to put on and take off. My pup loves it! 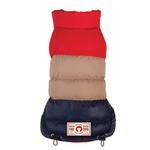 The colors are great and I love that it has the elastic cord on the back so it can conform to my dogs back end. Highly recommend! I love Baxterboo and I am so thankful that they have hoodies that fit my pitbull! 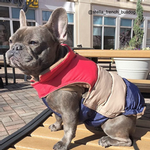 (big dogs get cold too!!). My only thought is that you folks should offer free returns- a lot of times the clothing doesn't fit the first go around, and I think you will keep your customers happier with the option of sending the clothing back for free. Thank you!